Meg Ellis just wanted to create a tool to help people. It wasn’t until South Carolina’s October floods that she realized how much of a resource her Chasing Tails Pet Patrol Facebook page has become. Until this October, Meg Ellis’ Chasing Tails Pet Patrol page on Facebook had hummed along for four years, helping what she estimates were at least 300 lost pets in the Midlands find their way back home. Then came the rains, and traffic exploded. Molly’s updated Chasing Tails post, explaining her 8-mile journey to Percival Road. When Molly, their choclate Lab and basset hound mix, scampered through an open gate while they cleaned up flood damage at their Forest Acres home, Tom and Jacy Barry discovered the reach of Chasing Tails and the power of social media. Molly escaped about noon, Jacy Barry said. With Ellis’ help and that of the Forest Acres police, Molly was found near Percival Road, nearly 8 miles away, and was back home that night, almost nine hours later. After Molly left, Tom Barry called the police where a dispatcher had gotten an earlier call about a dog matching Molly’s description lying in a Forest Acres resident’s driveway. The police routinely call Ellis, who lives in Forest Acres, on lost-pet cases, and she arranged for the Barrys to pick up Molly while the Chasing Tails Facebook post about Molly’s disappearance was updated to show she was back home. “I kept finding dogs wandering around in my neighborhood, and I would diligently try to find their owners, and after doing that for a while I realized there wasn’t anywhere really to get help to try and get these animals back home,” she said. Pawmetto Lifeline’s Mungo Foundation page is helping raise money for Lexington and Richland counties. Article written on other social media site helping pets and their owners. An interactive map created on ZeeMaps that shows screenshot Chasing Tails Pet Patrol Facebook posts of lost pets found in different parts of Columbia during the floods. The Chasing Tails page is updated throughout the day. Pictures of lost animals and posts of people who have found lost pets go up while older posts are labeled as RTO, for returned to owner, or refreshed with the latest information. Ellis, who has a full-time job, said she does the best she can updating the site in her free time, but that she also has help from people she has come to know at animal shelters and through neighborhood searches of lost pets. Ellis said she’s thrilled to see her desire to help pet owners grow into a community resource. “People that have been reunited with their pet will say, ‘Thanks so much for everyone helping, and now that I’ve found mine, I want to give back,’ and they’ll share posts and be very watchful,” Ellis said. The old-fashioned way of trying to find a lost pet was to take out ads in the newspaper and print fliers and post them around town. But social media has taken on a greater role because in today’s world the traditional ways are “easily ignored,” said Elizabeth Childers, a spokeswoman for Columbia’s Pawmetto Lifeline animal rescue center. 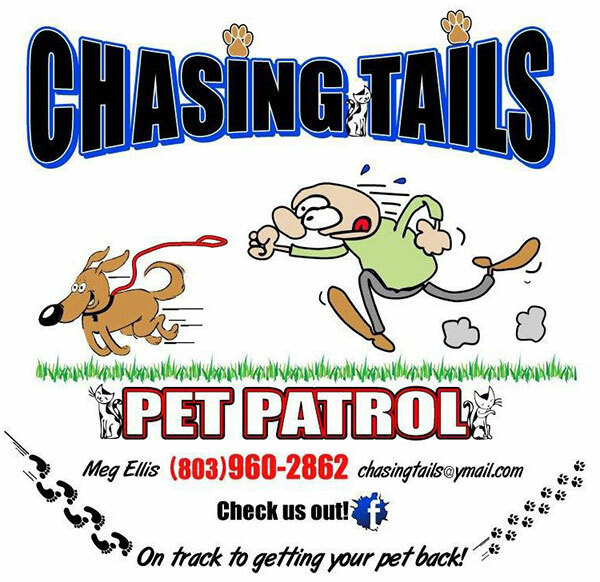 Mullett, a dog that Ellis adopted, sits at the base of a palmetto tree in another Chasing Tails Pet Patrol logo (provided by Meg Ellis). Pawmetto Lifeline directs all its lost and found pet cases to the Chasing Tails page. The Chasing Tails page traffic is just one indicator of the problems animals faced during the flood. Pawmetto Lifeline, which Ellis says she has worked with regularly over the years, said it transferred over 120 animals from flooded areas and other local shelters to shelters throughout the country. The local Mungo Foundation is matching donations to the pet-rescue group through the end of the year and will give the money to flood relief funds in Lexington and Richland counties, Childers said. Lost and Found Pets of South Carolina, another Facebook page that helps owners find their lost animals, posted its own listings as well as cross-sharing listing with Chasing Tails. Not every pet lost during the flood was successfully reunited with its owners. But Ellis said that while it is hard and frustrating to lose a pet, she has seen some pets lost before she started Chasing Tails and their owners reunited through her page years later. “I tell people definitely not to give up, and I know it is disheartening and it becomes very frustrating, but you just never know where they are going to end up,” she said.